Origin and Habitat: Type Locality 70 km West North West of Griquatown, South Africa. 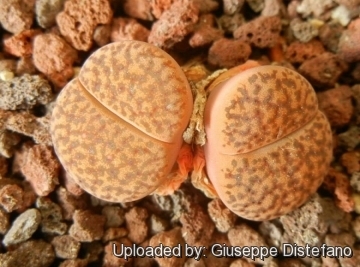 Description: Lithops bromfieldii var. glaudinde is one of the local form of the variable Lithops bromfieldii. It is a medium sized plant characterised by a wide, flattened, blackish-red apex, with conspicuous glossy black dusky dots with a shining metallic reflex. However some of the more recently discovered populations (including Cole 382, typically smooth and rough) do not really respect this model; they represent an extension of the range and of the concept. And also some old plants cultivated in the Karoo Garden (Collected in the region of Kougas) shows the same patterns. While other populations have an embarrassing resemblance to the standard Lithops bromfieldii and are often indistinguishable, except perhaps in leaf shape and cultivated plants can be reliably distinguished from Lithops bromfieldii only when seeds or details of wild source are available. Habit: Solitary or forming clumps of two to 10 or more heads, (mostly 2-4) to 1,5 cm high. It conforms to the typical Lithops morphology: two thick, fleshy windowed leaves separated by a crack from which a yellow flower appears. The windowed part allows light into the inner portion of the leaf where the process of photosynthesis is carried out. As with many other species, several varieties or local forms have been described based on the variation of the colour of the tops of the leaves. Bodies (paired leaves): Mostly about 25 X 20 mm obconical, truncate with a wide, flattened, blackish-red apex with a shining metallic reflex. The fissure is shallow, 4-8 mm; lobes conjunct. The face is opaque, more or less translucent and smooth, bullate, with numerous, narrow, irregular channels, and small irregular islands with indistinct flecks composed of small opaque dots. The margins with small irregular peninsula are quite indistinct. Rubrications partially visible, sometimes with longer lines forming a sparse broken network. Shoulders, margins and islands as for the margins opaque light honey, pinkish brown or light orange-brown. Windows and channels transluscent dull green, dark greenish brown or greenish red. Rubrications dull blood-red. Flowers: Yellow, small to large 25-35(-45) mm in diameter. Fruits: Mostly 5-chambered, profile boat-shaped, top flat. Note: Fearn recognizes Lithops glaudinae de Boer as a good species in its own, while Cole treats it as a variety of Lithops bromfieldii. 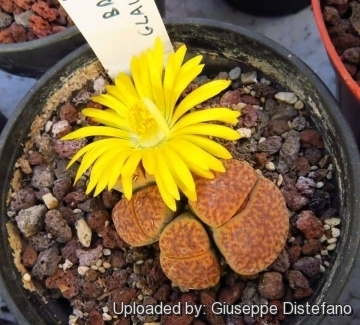 Lithops bromfieldii L. Bolus: (var. bromfieldii) Medium sized with a bullate top surface and generally reddish coloured. Distribution: Cape province. 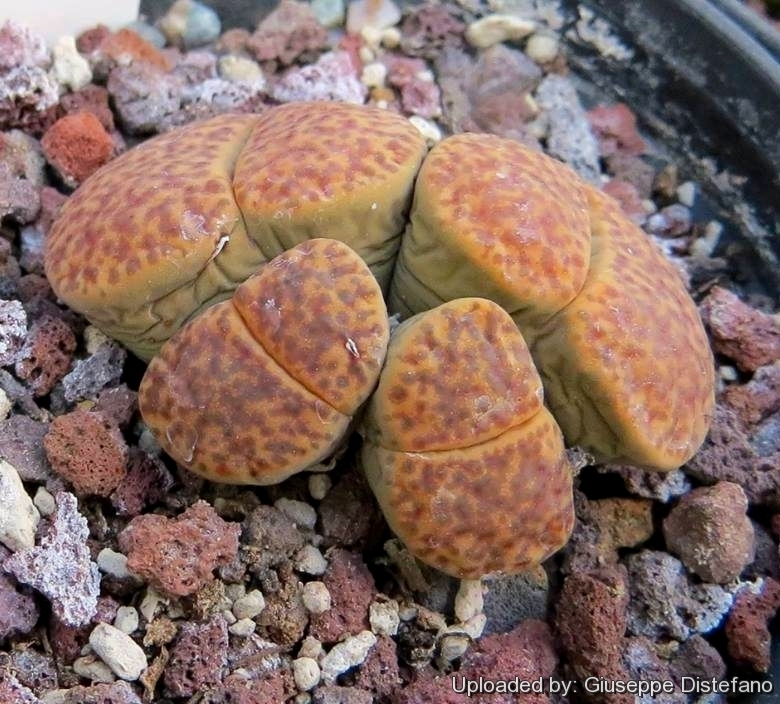 Lithops bromfieldii C040 TL: 15 km ENE of Upington, South Africa: rusty orange, red lines. Lithops bromfieldii C041 15 km ENE of Upington, South Africa: dark red lines & dots. Lithops bromfieldii C279 45 km E of Upington, South Africa: like red-veined marble. Lithops bromfieldii C348 20km East of Upington, Cape Province, South Africa: variable, dark brown to milky green. Lithops bromfieldii var. glaudinae (de Boer) D.T.Cole: Medium sized characterized by many dusky dots with a shining metallic reflex. Rubrications dull blood-red. Lithops bromfieldii var. glaudinae C116 TL: 70 km WNW of Griquatown, South Africa: graphitic luster. Lithops bromfieldii var. glaudinae C382 70 km W of Griquatown, South Africa: unusual form. Lithops bromfieldii var. insularis C042 15 km E of Keimoes, South Africa: dusky, with red dots. Lithops bromfieldii var. insularis C057 10 km NE of Keimoes, South Africa: grey brown top, red lines. Lithops bromfieldii var. menellii (L. Bolus) B.Fearn: Medium sized form with rugose surface, pinkish-grey facial colour and very dark rubrications. Lithops bromfieldii var. menellii C044 TL: 25 km SSW of Upington, South Africa: grey brown top, red lines. Lithops bromfieldii var. menellii C283 20 km SSW of Upington, South Africa: Hebrew script. Lithops bromfieldii var. sulphurea C362 D.T.Cole: Small to medium sized green monster.